As you may know, I am a huge fan of Guild guitars and especially their vintage HB1 pickups. Guild recently released a new version of the coveted HB1s, so I bought one and decided to see how it compared with a vintage model. As of right now, this comparison is only regarding appearance and size. I’ll report on sound differences later. Short story: they are almost exactly the same size! Let’s look at the details. From an appearance standpoint, the new pickups look fantastic. I would not be able to tell one from a vintage model from the front, which is fantastic and also concerning. The sceptic part of me realizes that unscrupulous sellers may put these into vintage instruments and pass them off as vintage. 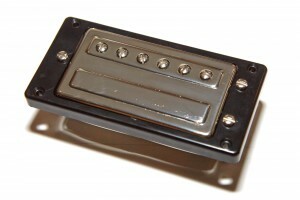 The happy part of me celebrates that there is finally a modern option for these great vintage pickups should they fail or become damaged. Note that even the new screws look like the old vintage models, an example of which is shown here on my old Guild Nightbird with HB1s. 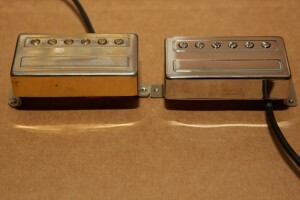 Size-wise, the new pickups are almost exactly the same size. From a width and height standpoint, they look identical. The picture to the right is of a vintage HB1 from the 1970s sitting perfectly in the ring from the new HB1 purchased in 2016. The reason I write that they’re an almost perfect match is because the vintage pickup has slightly more depth to it as seen in this image. This is due to the legs being just a bit longer on the vintage HB1. 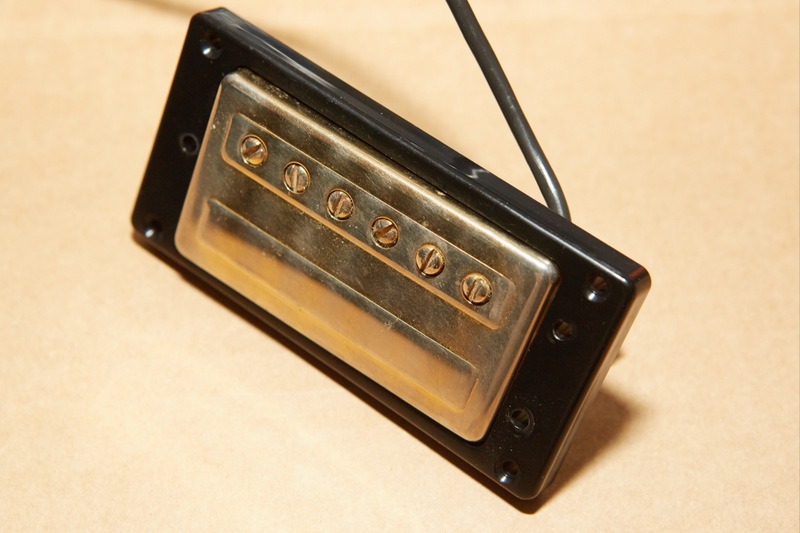 Given the choice, this is the preferred outcome since this means that new pickups will fit into vintage instruments designed for the slightly deeper vintage HB1s. This *may* also mean that a vintage HB1 may be too deep for a modern Guild. I’ll update this post when I attempt to put the vintage HB1 into a new Newark Street Guild S100 later this week. Note that the adjustment screws line up perfectly on the old pickup with the new bezel! This could mean that the new bezels can be direct replacements for old, cracked bezels from vintage instruments. As a collector of new and vintage Guilds, this is good news. If you’re trying to figure out if a guitar you’ve bought has new or old HB1s in it, I’m sorry to say that the only way to tell the difference between these two models is to remove them and examine the backs. 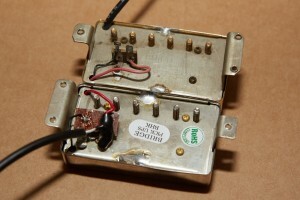 The back of the vintage HB1 (top in the picture) has no stickers, should be stamped “Guild Made in USA”, may be hand-engraved with a date from the factory, and has the small solder lug situated perpendicular to the pickup. 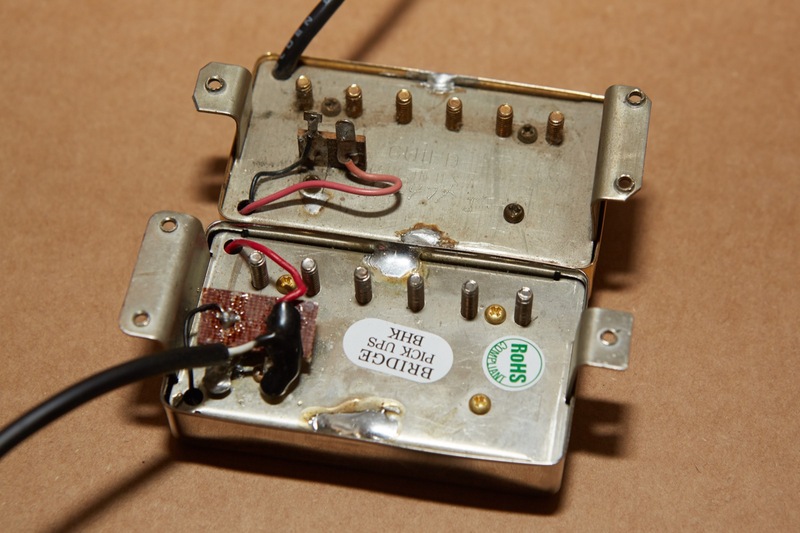 The new HB1 (bottom in the picture) has stickers on it (which may have been removed), no stamping, no engraving, a larger solder lug that laying more parallel to the pickup and may also have some non-conductive “goop” on it. I’ll update with more information when I can make some recordings of how they each sound in the same guitar. any news on the verdict? I am a very proud owner of an ’97 AA and ’93 Paladin T…… Awesome….. something else? 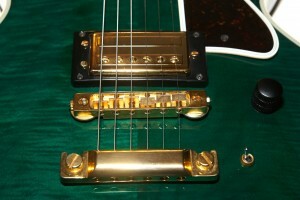 But I have been curious — and the Seymor Duncans and Tone Pro hardware on the Bluesbird made me bite. Hey there – My daughter is the primary player of the NS BB, so I haven’t fiddled with it. I can say that the SD pickups are cool but I’d definitely prefer a more PAFish pickup. That’s also a huge personal preference thing, so your mileage may vary, as the marketers say.